Cold and wet is the week we had in Lanark. We had about 3 inches of rain this week with a little snow on Friday. Most of the corn is in the ground, very few beans. Customers have switched over to beans and ready to go when it dries out again. Some corn has been popping through and is looking pretty good so far. Some customers are getting there rotary hoes checked over and ready to go also. I had a customer calling me that was getting ACK warning on his GS3 then it would reboot and he would lose his documentation. I found that he was running AB Curves for tracking mode, I then looked at his software and found that it was at 3.16. If you remember back 1 year ago we had that same issue with that software. I installed the latest software and I will find out next week if that fixed it. Check here for the latest software versions. We have been having some issues with a new 1770NT 24 row that has chain drive row clutches that trash is getting wrapped around the clutch sprockets and causing them to start slipping. 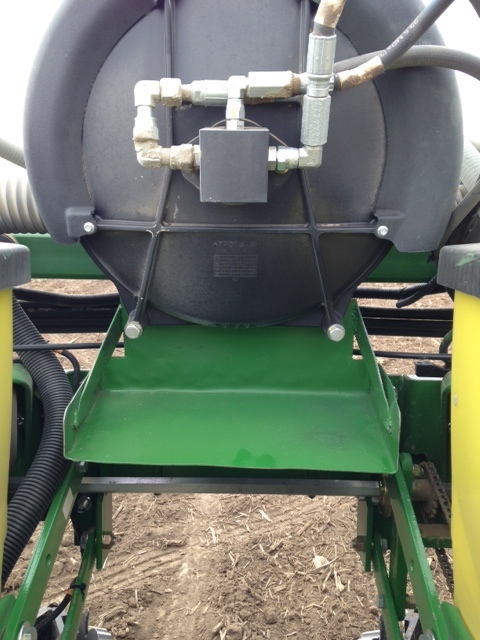 After checking it over, we noticed it was on the rows that has the vac motor in between them. The vac motors are creating a turbulence that throws the trash around and then get wrapped around the sprockets. We came up with a deflector to help move the vacuum air back and out of the way. See picture below for reference.